Instructions: Cut a piece of Cardstock of 6 x 12" and fold it in half, then your card is 6 x 6". Cut a piece of designer paper from the Love paper Collection at 5 3/4" x 5 3/4". Use distress tool to distress all of the edges, tear your paper on the upper side, ink all your edges with the Vintage photo. Take the Big forever Love Background stamp and stamp this with Versa mark Ink, sprinkle with gold embossing powder on top and melt this with your Heat tool. Glue a piece of lace behind the tear and glue the whole part on top of the card. Now mat your photo with 3D foam tape on a piece of cardstock which is a little bit bigger then the photo, Ink all the edges of the cardstock and the photo. 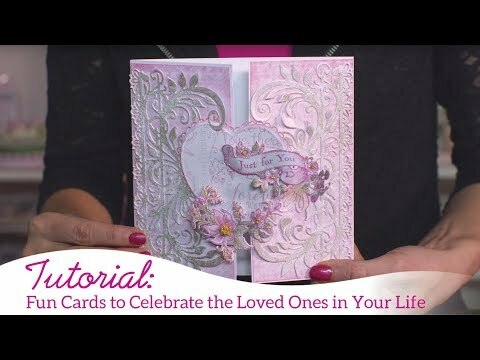 Cut out a heart with the Heart Die and then you place the bottom part of the photo in it stick a corner sticker on the left bottom corner of the photo and glue this all down on the top of the card. Tie a bow around the left side of the heart with a piece of lace and add an embellishment to it. You can also glue an embellishment on the piece of lace where you made the tear. Now stamp some rose vines with the black versa fine Ink and color them with a mix of the bamboo leaves and new Sprout and Vintage photo, cut them out with the coordinating die and glue some rose vines on the bottom of the heart. Stamp some Dogwood flowers with Rhubarb Stalk and color them with Rose Bud very lightly and in the middle add some New Sprout. Cut them out with the coordinating die and shape them with the Deluxe Flower Shaping Kit. Make a hole in the centre and pull some stamens through it and cover them with Crystal clear. Now glue them on top of the vines. Decorate the front also with some dots with the pearl pen. For the inside cut 2 pieces of Design paper of 5 3/4 x 5 3/4 inches, distress them and Ink them with Vintage Photo and glue the upper one down. Cut a heart from the eyelets heart dies and glue this on top of the design paper, stamp the word I love you from the Love sentiments with Versa mark Ink and put Gold embossing powder on it and melt it with the heat tool. Cut a dark pink border with the Sweetheart Border die and adhere to the center of the 2 1/2 x 8" with a strip of tape. Score this strip on both sides at 1 1/4 inch, add dries clear adhesive to the flaps, the bottom edge and the side edges, wrap the one inch flaps around the back of the 5 3/4 x 5 3/4" designer paper and adhere to form a pocket. Glue the whole thing down on the bottom part of your card base. Cut out a sentiment from the paper collection, Ink all the edges with Vintage photo, mat it on dark pink cardstock and glue it down on top of the pocket you just created. Cut a journaling card out from the design paper, ink the edges with Vintage Photo and mat this on cardstock and put it in your pocket and your card is ready to send!